Peter’s write-up of the competition. Well folks, November is at an end and another Dark Horse event has come and gone. The first time I had heard about the Dark Horse Competition was sometime last year. Up until then I had been on an indoor climbing competition hiatus. A competition burn out by age 13, I found my attention focused on tearing up the crags from my home state of California to as far West as Utah. I started setting full time too, a job which afforded frequent time off for road trips. It was only last year I found myself setting for a major competition when inspiration suddenly struck. As I watched some top climbers compete for a major cash purse I thought to myself, “I could do that.” A years worth of competitions later, which included hitting first place at all three major North West Coast comps, placing 6th at ABS Nationals, representing the American team at the World Cup in Vail, and most recently placing third at Dark Horse, I now find myself with a new perspective on competition climbing. Most of all I’m struck by the irony of being coined the dark horse at ABS Nationals before I’d even fulfilled my goal to compete at Dark Horse. I only talk about my endeavors when asked, and for the most part hold down a full time job, climb on the weekends and occasionally take a road trip. This type of life style rarely leads one to notoriety and fame. Up until last year, I was just another strong kid, and my only fame in climbing came from working as a route-setter in local indoor climbing gyms. Yet I’m exactly the type of climber Dark Horse exists for. We come out of the woodwork so to speak, from small towns to major cities, out of the way crags to major climbing destinations. We are the quiet and unassuming crushers who are the unsung heroes of countless FA’s, bolted lines or unpublished guide books. The phrase “Dark Horse” itself is used to describe us who unexpectedly competed against the best known climbers and give them a run for their money. Today, the Dark Horse series is known as the competition of the year for young gun climbers and unknown crushers to test their skills against some of the best known athletes in bouldering. From a competitor perspective, November’s comp was a close race. I arrived at MetroRock’s Newburyport location without a clue as to who was going to be my competition. The gym is located in an industrial district of town and dominated by a gigantic wind turbine that looms next door. Without a clue as to what I was walking into I was both surprised and comforted by the scene around me. The gym was older in style and design, which reminded me of the types of gyms I grew up climbing in. The air was thick with chalk dust and the place was packed. There were tons of kids, parents and spectators and you could tell that the energy level was high. I checked in, grabbed my scorecard, and scoped the rules. I was pleasantly surprised to find that the entire competition was peer judged (a first for me) and enjoyed the laid back vibe of the event. This also meant that there were no true lines for climbs and resembled more of a casual bouldering session in a crowded gym than a climbing competition. 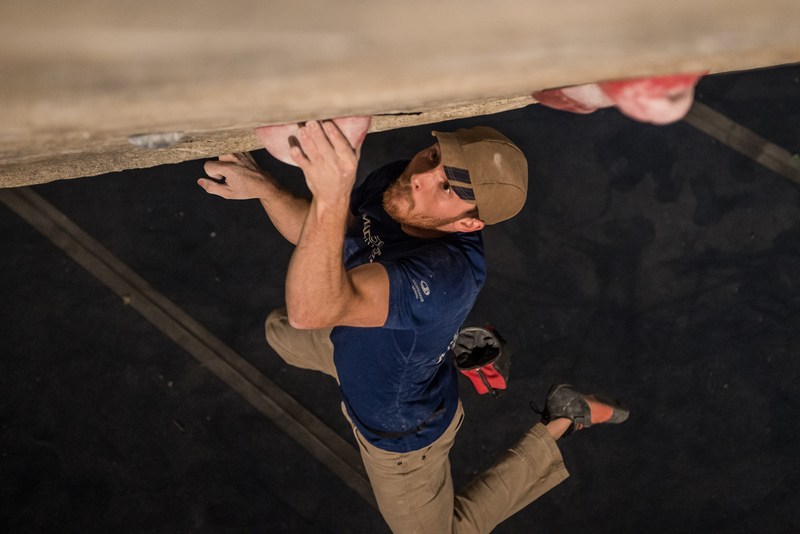 It was soon apparent that making it into the final round was going to come down to climbing the top five hardest problems. Because I made short work of those routes I was assured my place into the final round, and confident that I would place well in the finals. Between rounds, I made my way to an amazing organic vegan restaurant to fuel up. I would highly recommend this place called Mandarava in downtown Newburyport where I relaxed and recovered for the finals. Once finals began, the gym was packed. Competitor isolation was huge and the crowd was psyched but I could tell everyone was a little tired. The final round consisted of four problems. However, there was a stopper move on problem four, so the finals really came down to the first three climbs for all. Problem one was a technical balance problem with a tough high step before the last move. Although I flashed this problem it gave quite a few competitors a tough time. Problem two was crowd pleasing and thuggy requiring dynamic movement on slopers. This would typically be very much my style however I was shut down on the too big pinch move halfway through. Problem three was a straightforward crimpy campus problem that I and most of the other competitors either flashed or made short work of. Again I flashed problem 3 and was eager to make up some lost points from problem 2 on the last problem. Problem 4 looked awesome and seemed “doable” but everyone fell on the forth move. From a route setter’s perspective, it seemed to suggest a little last minute adjustment that turned out to be unneeded. Overall I placed 3rd and come away feeling good about my performance, great about the event and experience as a whole. There was a tinge of feeling a little left to be desired from the route-setting-this of course comes after working eight years as a setter and knowing just how hard it is to set for an event like this. I’m psyched and already in the midst of training for December’s competition-hope to see you all there!